Peer 1 in Southampton boasts a slide and even a pub, but does that automatically mean employees are happier? Forget office slides and ping pong tables, employee engagement should be nurtured via long-term enrichment, according to the founder of customer loyalty company Avinity. Cath Everett reports. Employers are doing all kinds of weird and wonderful things in the name of employee engagement. US tech giant Google with its “chief happiness officer” and slides installed between office floors to make moving around more “fun” is a case in point. 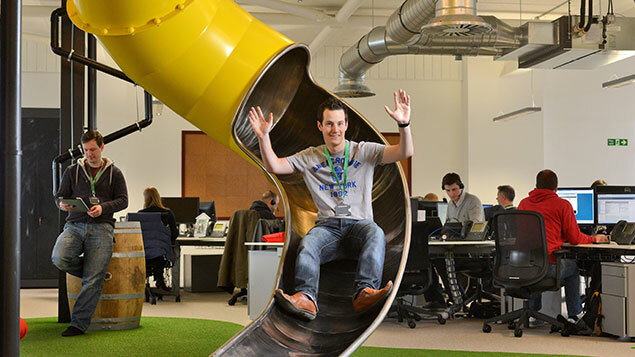 Even in the UK we have web-hosting provider Peer 1 Hosting offering such delights as a tree house, a pub, a pool table and green helter-skelter slide in a bid to unleash creative energy and boost motivation. But Rupert Poulson, founder and chief executive of Avinity, which specialises in customer loyalty programmes, is sceptical about the long-term benefits of such initiatives. He says that one of the most important factors in engagement actually relates to internal employee happiness rather than external stimuli. This means, in the same way that buying children a lollipop will please them for a few minutes, “faux fun” will have equally short-term benefits. “To have the resources and enthusiasm to be engaged at work, employees have to feel happy in themselves, so it’s not just about the nine-to-five,” he says. He adds this means that helping staff members to “live a better life” can be a positive starting point from which to build true engagement. These insights have been hard won. A couple of years ago, Poulson says he had become stressed. His diet was poor, he had no time to catch up with friends and everything was focused around work. This situation led him to read extensively about human motivation and behaviour, which in turn brought him to an understanding of the importance of happiness in making people feel positive, empowered, enthusiastic and energised. All of these ingredients, he adds, make opening the door to engagement much more likely. As a result, he decided to develop a social engagement platform to put such ideas into practice. AvinityAlive, which was launched in spring this year, provides employees with more than 1,000 purely optional personal, philanthropic and community “micro-challenges” to help enrich their lives, both at work and beyond. These challenges, which can range from undertaking random acts of kindness to swapping unhealthy for healthy snacks for 30 days, are customised to fit in with a company’s own values (such as promoting volunteering) and requirements such as bringing disjointed teams together following an acquisition, for example. “The benefit for HR is that the entire company can start living and breathing the corporate values connected to the challenges, when traditionally so many have been left in the boardroom,” Poulson says. A second element of the platform consists of a social wall. It enables staff to create their own community by posting blogs, photos and videos about the challenges they have undertaken. “It’s about ensuring people feel listened to and providing a positive place to hang out, which plays a big part in helping them feel connected to each other and the company,” Poulson says. The focus of the social wall is on completing challenges – “There’s no room for negativity”, he adds. The final component of the system consists of peer-to-peer rewards and recognition functionality. This enables employees to thank colleagues for the helpful or impressive things they have done, particularly as they relate to company values, and post their messages to the social wall. Reward points are earned when a challenge has been completed or recognition has been received and they are added to a “value pillar” on each employee’s dashboard. Once it is full and the completed challenges are verified, staff can then redeem their points for the rewards of their choice. “In most schemes, it’s managers who do the recognition, but in today’s world, it should be less about control and more about recognition from the bottom up, which enables everyone to get involved,” Poulson says. The white-label, cloud-based system is customised to meet the requirements of each client, which pays an initial set-up and per-employee subscription fee. Poulson concludes: “It takes courage to hand a platform over to staff and say ‘here you go’, but it really does build trust and employees appreciate that.